Hispanic or Latino ethnicity is defined as being "a person of Cuban, Mexican, Puerto Rican, South or Central American, or other Spanish culture or origin regardless of race." Hispanic people are the largest minority in the United States. 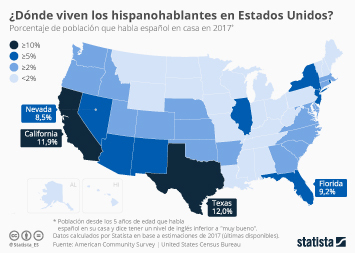 In 2015, almost 57 million people of Hispanic origin were living in the U.S. By 2050, it is projected that the Hispanic population will reach the 143 million mark, a significant factor in U.S. population growth. As of 2015, about 13 million families of Hispanic descent were residing in the United States. In recent years, the fastest Hispanic population growth has tended to come in areas with a relatively small number of Latinos. Thanks to a boom in Bakken shale oil production, North Dakota has some of the fastest-growing counties by Latino population in the United States. In 2015, there were 26,000 people with Hispanic descent living in North Dakota. California, on the contrary, with more than 18 million people in 2015, has been home to the largest Latino diaspora for many decades ahead of such states as Texas and Florida. In regard to the origin countries of the Hispanic population, more than 35 million of the U.S. Hispanic population was of Mexican descent in 2014. The second largest Hispanic ethnic group was Puerto Rican, with about 5.3 million people residing in the United Sates. Salvadorians constituted the third largest Latino ethnic group with estimated 2.1 million people. Most Hispanics are bilingual, speaking both Spanish and English. About 24 percent of foreign-born adult Hispanics living in the U.S. said they could speak English “very well” in 2014. At the same time, roughly 61 percent stated that they spoke English less than “very well”. Language proficiency affects employability and income level. This could partly be the reason for the relatively high unemployment rate among the people with Hispanic ethnicity, which was 7 percent in 2016. In comparison, the average U.S. unemployment rate was 4.9 percent in the same year. In 2015, the median weekly earnings of a Latino full-time employee amounted to 604 U.S. dollars in the United States, which was 205 U.S. dollars beneath the total population median. English proficiency among foreign-born Hispanics U.S. 2015, by years in the U.S.
Topic: Hispanic health in the U.S.
Topic: Hispanic media in the U.S.